This appetizer is simple to make and so, so tasty! 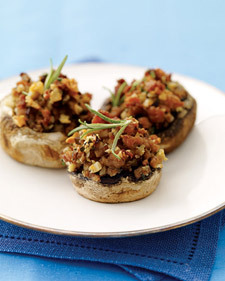 Hazelnuts are not a common ingredient in many recipes, so it puts a different twist on the common stuffed mushroom recipe! Remember, you can always use any of the organic counterparts to any recipe ingredients. Thanks to WholeLiving.com for this savory find! Preheat oven to 375 degrees. In a large skillet, heat oil over medium. Add sausage and cook, breaking up with a wooden spoon, until no longer pink, 3 to 5 minutes. Remove stems from mushrooms, trim ends, and finely chop. Add chopped stems, hazelnuts, garlic, shallot, and rosemary to sausage; season with salt and pepper. Cook until vegetables are tender, 4 to 6 minutes; transfer to a bowl and set aside to cool. To cooled sausage mixture, add egg and breadcrumbs; stir to combine. Place mushroom caps on a large rimmed baking sheet and season cavities with salt and pepper. Stuff caps with sausage mixture, packing tightly. Bake mushrooms until tops are browned and caps are tender, 25 to 30 minutes. Sprinkle with additional rosemary before serving. http://tinygreenmom.com/wp-content/uploads/2018/07/logo-sm.png 0 0 Tiny Green Mom http://tinygreenmom.com/wp-content/uploads/2018/07/logo-sm.png Tiny Green Mom2010-05-20 05:00:472010-06-01 12:19:44Recipe of the Day! Wembe Free Tea Sample from Good Earth®!